Heat oven to 350°F. In large bowl, combine sugar, brown sugar, peanut butter and butter; beat until light and fluffy. Add eggs, 1 at a time, beating well after each addition. Add oats and baking soda; mix well. Stir in chocolate chips, chocolate pieces, peanuts and raisins. Drop dough by heaping tablespoonfuls 2 1/2 inches apart onto ungreased cookie sheets. Bake at 350°F. for 11 to 14 minutes or until light golden brown. Cool 2 minutes; remove from cookie sheets. 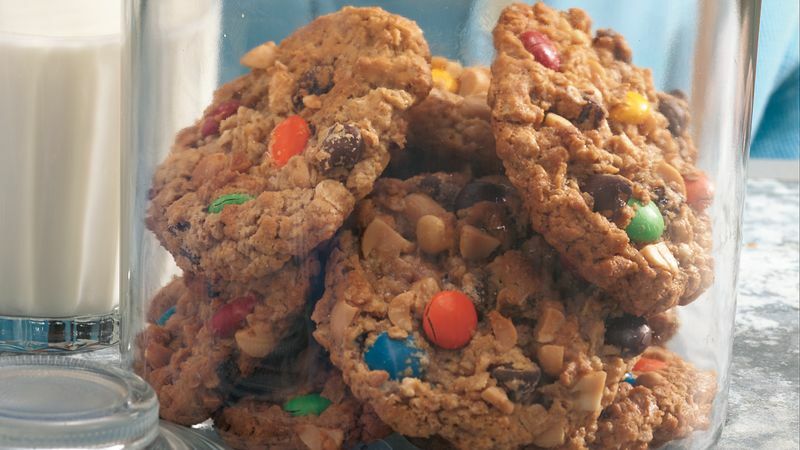 Cookie monsters of all ages love this recipe. Moms like the big batch, perfect for bake sales, scout meetings and parties. These giant oatmeal cookies are based on quick-cooking rolled oats, not flour. Remember this recipe when it's time to bake for a friend who cannot eat wheat. Try candy-coated peanut butter candies, dried cherries or cranberries, walnuts or pecans, and butterscotch, peanut butter or white chocolate chips.